Here is one of the hardest to find Marmit Vinyl Paradise Figures. 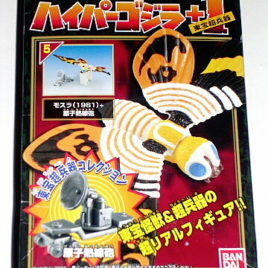 This is a Theater exclusive figure which was ONLY available at some of the movie theaters in Japan showing the 1985 South Korean Film Pulgasari. 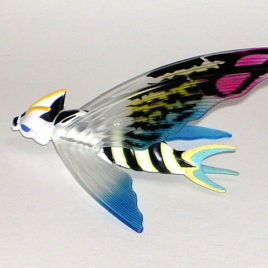 Pulgasari was made in 3 color variations by Marmit in 1998. The figure has been out of production since 1998. It was produced in limited numbers. The beautiful golden color is the most limited and hardest to find. The figure is mint and is numbered VP 65. Does not come with header or bag. It is made of hard vinyl and stands approximately 10 1/2 inches. The movie which was banned in North Korea tells the story of a peasant uprising in Feudal Korea. The king wishes to limit weapon making so he steals all iron and cooking pots. He imprisions a blacksmith who dies. Before he dies he make a small monster figure Pulgsari. Pulgasari comes to life and grows when the blacksmith's daughter pricks her finger and blood drips on the figure. Monster Mayhem ensues. 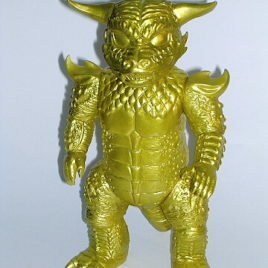 Kenpachiro Satsuma who played Godzilla in most of the 1980-1990's Godzilla movies plays Pulgasari. Other Toho Film personnel were involved in the making of the movie. Here is one of the hardest PULGASARI figures to find! This is a LIMITED RED PULGASARI THAT COMES IN BOX. 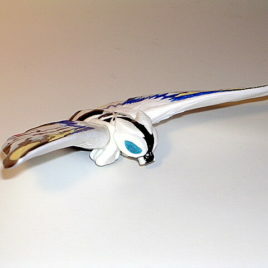 This very rare boxed Pulgasari includes a mini Pulgasari which stands approx. 3 1/2 inches. 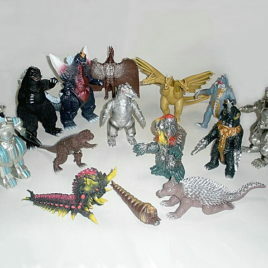 These figures were made to celebrate the 1985 South Korean Film Pulgasari. THEY ONLY MADE 100 of the RED VERSION BOXED PULGASARE FIGURES! 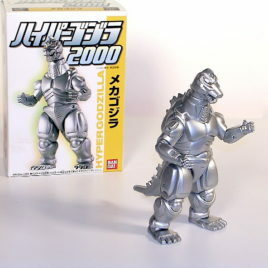 The figure has been out of production since 1998. This figure was made IN JAPAN by the KOREAN FILM EXPORT IMPORT CORPORATION. 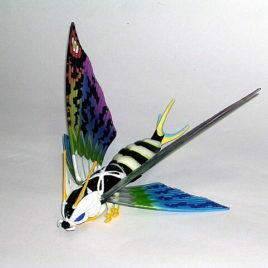 This impressive hard vinyl Pulgasari figure stands approx. 16 inches tall. PULGASARI LOOKS VERY, VERY ANGRY! 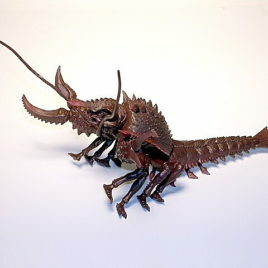 The figures is articulated at the head, arms, and legs. The movie which was banned in North Korea tells the story of a peasant uprising in Feudal Korea. The king wishes to limit weapon making so he steals all iron and cooking pots. He imprisions a blacksmith who dies. 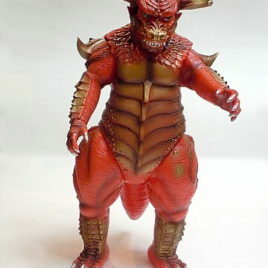 Before he dies he make a small monster figure Pulgsari. Pulgasari comes to life and grows when the blacksmith's daughter pricks her finger and blood drips on the figure. Monster Mayhem ensues. 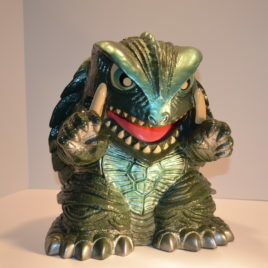 Kenpachiro Satsuma who played Godzilla in most of the 1980-1990's Godzilla movies plays Pulgasari. Other Toho Film personnel were involved in the making of the movie. COMES MINT IN Near Mint to Excellent BOX. CLAWMARK TOYS WARNING: This is a large figure in a large box and shipping cost will reflect that! Scroll down for additional photos. 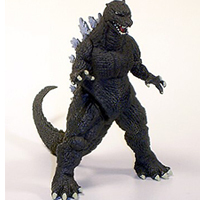 Here is the Godzilla 1995 from the Toho movie Godzilla vs Destroyer. 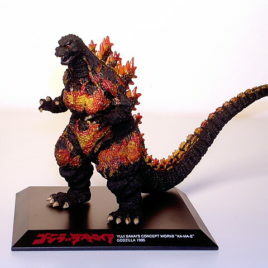 The GORGEOUS Burning Godzilla figure stands about 4 inches and is removeable from the base. 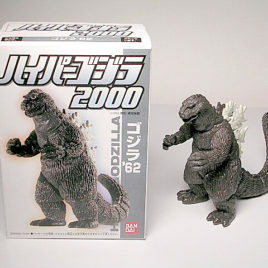 This is a beautiful Yuji Sakai Sculpt of Godzilla 1995 from his Bandai 2008 Concept Works Ka-Ma-E series. It Comes in its original box. This GORGEOUS vinyl figure of the Giant Warrior God is from the special exhibit at the Museum of Contemporary Art, Tokyo from July 10th 2012 to October 8th 2012 entitled Tokusatstu Special Effects Museum Craftsmanship of Showa and Heisei eras seen through miniatures. This figure is from the short film produced by Hideaki Anno and Shinji Higuchi called the Giant God Warrior Descends on Tokyo. This warrior figure was first seen in the Studio Ghibli production Nausicaa of the Valley of the Wind 1984. The exhibit was produced by Director Hieaki Anno and Studio Ghibli along with Shinji Higuchi and others such as M Ichigo's Yuji Nishimura. We were able to go to the exhibit several times and it was phenomenal. The figure made by Figma Max Factory x Masaki Apsy Action figure series is number SP-043. 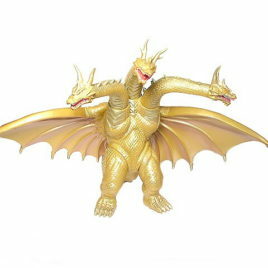 The figure stands approximately 7 inches tall and comes with many accessories such as wings and breath blasting mouthpiece. This AMAZING figure was only for sale or order during this wonderful exhibit. It is in Mint Condition in Mint Condition Box. THIS IS A REALLY COOL MONSTER!! We LOVE HIS CLAWS AND FEET! CLAWMARK TOYS WARNING: Not recommended for very young children due to sharp ends. Please scroll down for additional photos. 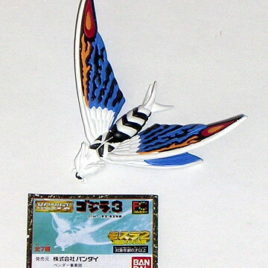 FROM THE 1995 MEMORIAL BOX SET, BATTORA LARVA! 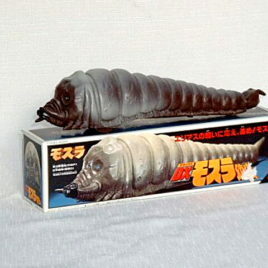 This soft vinyl Battora Larva is from the exciting Toho movie Godzilla vs. Mothra 1992. The larva is very impressive! 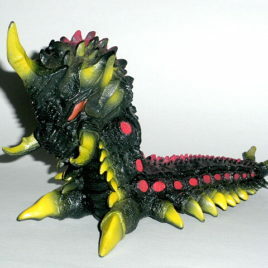 The larva is ARTICULATED because it is made of soft vinyl and you can pose its head. Battora Larva is very colorful, highly detailed and is approx. 7 1/2 inches long. HE LOOKS REALLY MEAN! It was originally produced in hard vinyl by Bandai in 1992 and re-released as part of the 14 piece MEMORIAL BOX SET. Out of Production and Hard to Find EVEN IN TOKYO! Battara Larva from the Memorial Box is more of a black and yellow and the original is more of a black and gold color. The figure is in NEAR MINT Condition. It is very close to MINT condition but does not come with its original loose card. Scroll down to see photos. FUN!! 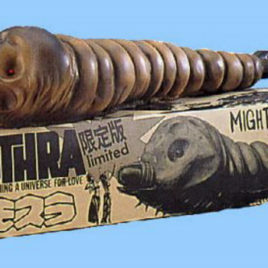 This is the Battery powered MOTHRA LARVA made by Bandai in 1996. The toy is approx. 10 inches long and the skin is made of flexable rubber. It crawls across the floor in a Larva like crawling manner! It crawls across any smooth surface and looks just like the mothra larvas from all the Godzilla and Mothra movies. IT TAKES TWO AA BATTERIES (NOT INCLUDED). MINT IN MINT BOX. CLAWMARK TOYS WARNING; PLAYING WITH THIS THING CAN BE ADDICTING! JUMBOSAURUS! 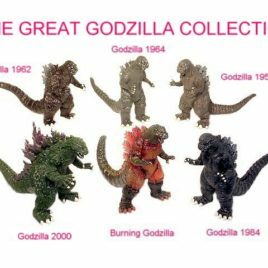 This is the ORIGINAL JAPANESE ACTION PACKED, PULL STRING ROARING Godzilla that was issued in 1978! 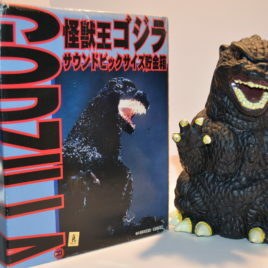 This AMAZING VINTAGE GODZILLA is in MINT CONDITION! Standing approx. 16 inches tall and approx. 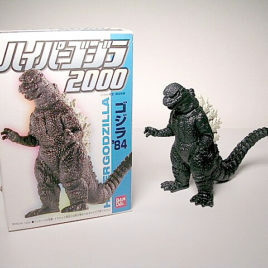 16 inches long, this piece of GODZILLA HISTORY is articulated at the arms and legs with a little articulation at the neck. The feet have small wheels on the bottom so you can push the figure across the floor. HIS RIGHT FIST IS SPRING LOADED and can be 'Fired" by pushing the button on the arm. THE SPRING IS LIKE NEW! When you pull the ring on the back of his neck, it makes a GODZILLA ROAR AND SHRIEK!! The paint on this vintage figure is MINT! The condition of the hard vinyl/plastic is MINT! WE BELIEVE THAT THIS JAPANESE SCULPT IS MUCH, MUCH MORE IMPRESSIVE THAN THE AMERICAN MADE SHOGAN WARRIOR. His tail must be put into place using a hair dryer to make it go on more easily. The Box is in C-7 condition and shows much wear. 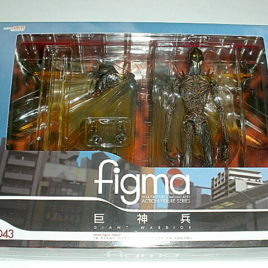 It is almost impossible to find this figure at all (even in Tokyo) let alone with a box! 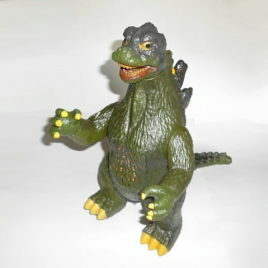 THIS IS ONE OF THE RAREST OF OLD JAPANESE GODZILLA ACTION TOYS. Comes with reproduction instruction sheet. CLAWMARK TOYS WARNING: Not suitable for very young children due to spring loaded flying fist! Scroll down for additional photos. 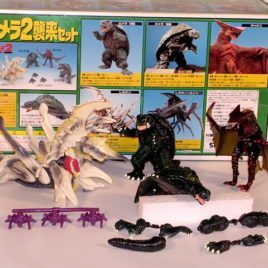 This is the Best of Godzilla 1998 Godzilla vs. Mothra Larva Diorama! 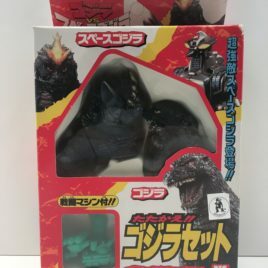 From Bandai Co. of Japan, this unique diorama combines Great Kaiju (Monsters) and translucent vinyl to produce ACTION GODZILLA SCENES. 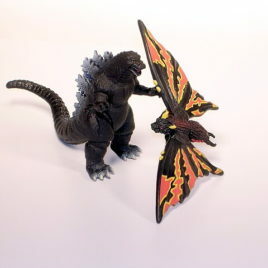 In this diorama Godzilla is standing near the Tokyo Dome shooting his ATOMIC BREATH at Mothra Larva!These dioramas were produced almost 15 years ago and are almost impossible to find EVEN IN JAPAN! 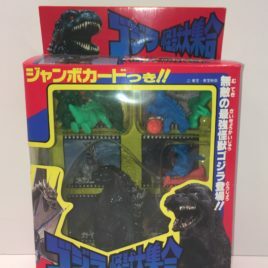 Even Godzillas Back Fins are Translucent Blue! Each Diorama is on a plastic base approx. 3 by 4 inches. The figures stand approx. 2 1/2 inches tall. The fins and some of the scenery are made of TRANSLUCENT VINYL. Comes in colorful Box. The BOX is MINT CONDITION which is NOW RARE to FIND. CLAWMARK TOYS WARNING: NOT SUITABLE FOR VERY YOUNG CHILDREN DUE TO VERY SMALL PARTS! Scroll down to view more photos.